Microsoft Office, the hit desktop and laptop office suite is freely available for Android devices. 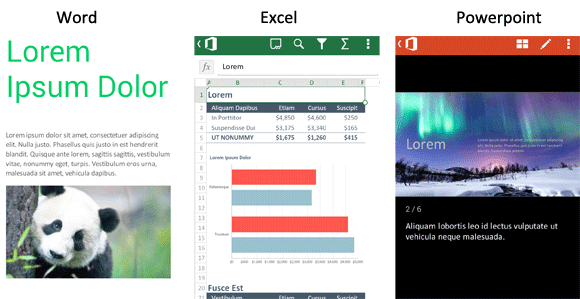 Microsoft has developed and released this mobile version of Microsoft Office for free. Using Microsoft Office Mobile, you will be able to create and edit Microsoft Word, Excel and PowerPoint documents from your mobile phone. Your documents, slides and spreadsheets can be easily viewed and edited on the go. Although, there are several other office suites, Word/PowerPoint/Excel viewers and editor apps in the Play Store, having the official one from Microsoft is always a good thing. The best part about this app is that it happens to be available for free. Another interesting feature of Microsoft Office Mobile is that it is fully integrated with Microsoft OneDrive which is a cloud storage solution from Microsoft. You can take your documents anywhere with your mobile device and access it from all your PCs and mobile devices. This is like a one stop cloud storage and access solution for all your office files. Integrated with Microsoft OneDrive: OneDrive is Microsoft’s cloud storage solution for all your files. If you create documents from your mobile phone, after saving you can access the same document from your PC or other mobile devices. Never worry about having to transfer files via email or data cables. View and edit all types of Office documents: Word, Excel and PowerPoint documents on the go. You can edit the files stored in your phone or you can access online files like the ones you get in emails as attachments. Edit them quickly with only your phone and this app. Popular Word and Excel templates available: Templates allow you to create new files with pre-specified formats. Just edit them to fill your needs and enter the values right away. Saves you a lot of time. For example: a budget file template in excel is available. Do what you did with desktop version of Microsoft Office: Add pictures, charts, diagrams, text formatting, tables etc. View the sample files to get an overview of everything that you can do. Seamless integration of your Microsoft account: Office 365 for business account holders can use their account plans on mobile devices. Sharing Features: Using Android's powerful sharing features, you can share the documents that you create with other supported apps. This feature is useful for quickly emailing the office files that you create in your mobile.